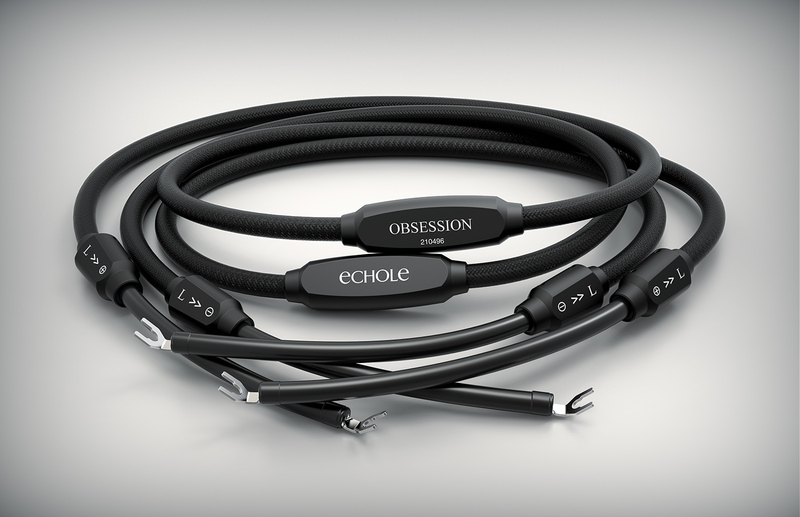 Introduced in 2013, the PASSION is Echole Cables’ entry-level line of cables. Although ‘entry-level’, the performance is already perceived to be quite independent of the price range. As the pioneer in the use of Silver, Gold and Palladium alloy, Echole Cables is now also pioneering plating its own unique Copper structure with this alloy in the new PASSION model. In this way, Echole’s sonic characteristics of naturalness and neutrality are precisely presented in the new PASSION model. The ultra-high purity 8N Copper is extruded under strict conditions in the Echole facility. The proprietary Silver/Gold/Palladium alloy is then plated and triple polished on the surface of the Echole-specific solid-core copper structure. The use of this custom Silver/Gold/Palladium alloy plating and precision hand-polishing is known to be unique in the high-end audio cable market. Solid-core 8N purity Copper, plated with Echole’s exclusive Silver/Gold/Palladium alloy, hand-braided and fully symmetrical. Termination: Palladium-polished Silver Oyaide terminations – Spades / Banana. Introduced in 2008, Echole OBSESSION is known as the pioneer cable in the market where Silver, Gold, Palladium alloys are used in a solid-core topology. As soon as the OBSESSION line was introduced, Echole quickly became a reference for many music lovers around the world with its unique reproduction qualities. Several runs of Teflon-insulated, 0.6 mm solid core OBSESSION-grade Silver/Gold/Palladium custom-structured alloy, several runs of 8N Purity Copper, hand-braided and fully symmetrical. Several runs of Teflon-insulated, 1.1mm solid core SIGNATURE-grade Silver/Gold/Palladium custom-structured alloy, several runs of 8N Purity Copper, hand-braided and fully symmetrical. 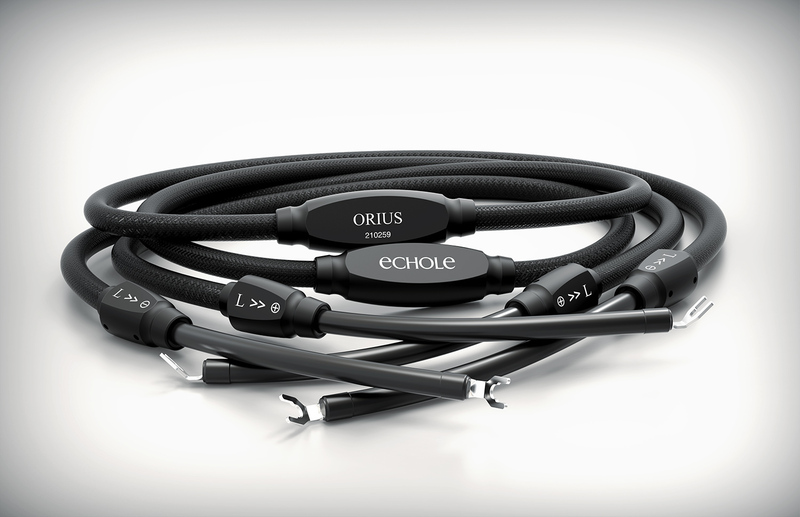 Echole’s ORIUS line is amongst the most expensively built cables in the market today, only one level beneath our reference model the OMNIA. Introduced in 2015, the unique properties of ORIUS are derived from the extremely high quantity of the most refined Silver, Gold, Palladium alloy. The final result is a suite of cables whose performance is quite close to the ultimate performance of the OMNIA line. ORIUS can be considered a relatively more affordable version of the OMNIA – where similar sonic characteristics of ultimate transparency, bass control, speed, coherency, soundstage width and depth, combine to deliver the most palpable sense of realism..
Several runs of Teflon-insulated, 1.4mm solid-core ORIUS-grade Silver/Gold/Palladium custom structured alloy, several runs of 8N Purity Copper, hand-braided and fully symmetrical. 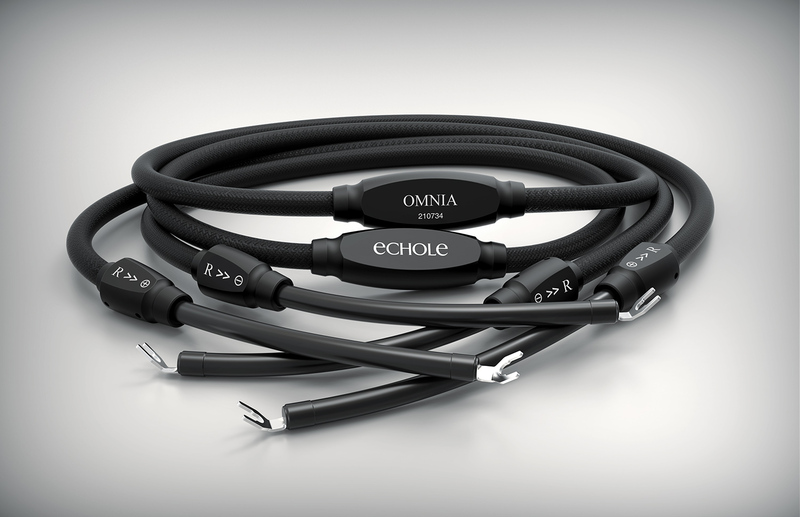 Echole’s OMNIA line is the most expensively built cable in the market today. Introduced in 2013, its unique properties are derived from the unprecedented quantity of the most refined Silver, Gold and Palladium alloy used in its construction. After years of research and development, the final result is a suite of cables at the pinnacle of high-end audio. OMNIA delivers the most naturally organic sounding and emotionally engaging, life-like performance. All audiophile parameters evolve significantly together with a musical involvement that all of our clients state as a paradigm shift. Several highly respected opinion leaders across the world have declared the OMNIA line as their current reference without peer. Several runs of Teflon-insulated, 1.7 mm solid core OMNIA-grade Silver/Gold/Palladium custom-structured alloy, several runs of 8N Purity Copper, hand-braided and fully symmetrical.